Well that's it. We are off later today to catch the round about midnight ferry from Dover. Our aged cousins are arrived after we've left and leaving before we return, it just seemed too mean not to allow them back into the house as this is the only holiday they get, if you call visiting the supermarkets, cleaning and moving my things about a holiday. Actually that does sound a bit like what I shall be doing in Italy plus the DIY. I've treated myself to these lovely new gold flip flops, Havaianas from Brazil which were considerably more expensive that the rubbish I usually wear, or indeed the free with a magazine ones I current use. The reviews were great, they look lovely, they feel comfy so I'll put them through their paces over the next month. I hope I can get on line while we are away to catch up with you all. 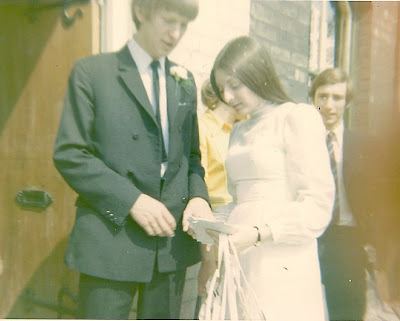 I have set up a post to appear on 20 June which will be our ruby wedding anniversary, some never before published photographs of our wedding 40 years ago. 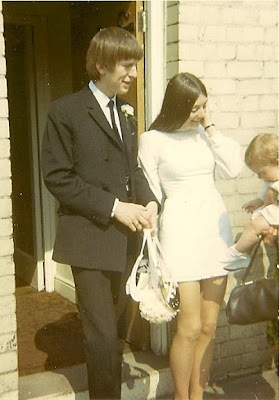 We won't be making a big fuss about the date, we certainly didn't at the time, probably still be working on the house. 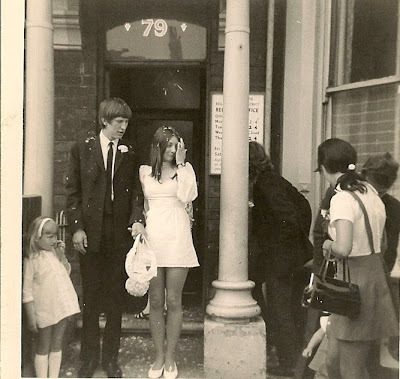 I just wish I'd asked for a pair of ruby flip flops to wear on our special day, might have clashed with the nail varnish though. On Thursday we set off to drive to Italy, should arrive at the casa on Sunday with stop overs in Strasbourg and Lake Garda. So exciting, we will be away for a month and I've spent many days trying on clothes and putting them either on the spare bed for packing or back in the wardrobe. I'm also taking out new sheets, towels and the like, its much easier to shop here or on line, my time in Italy is far too precious to spend traipsing round for household items, clothes, shoes and bags that's different. There's sock wool to select too, don't want to run out. I shall probably complete a pair on the journey out and another on the way back, perhaps I won't knit much while we are at the house as it should be hot but you never know. I've been working flat out in the garden, its looking wonderful and that's the only thing that worries me slightly. The weeds will run riot but there's nothing I can do about that except keep weeding until we leave. Mr FF has rigged up an amazing automatic irrigation system, a series of sprays in the greenhouse which my tomatoes are loving and a leaky pipe outside for my tubs and plants moved out of the conservatory. I'm a bit concerned that if we have a month of wet weather and the outside plants are getting watered they will all be washed away but since the house sitting situation still isn't resolved this might not be a concern. But on the positive side a whole month away, I'm sure once we get to the ferry I shall have forgotten all about my garden, by the time we get to Italy I shall be so relaxed. I'm not dwelling on the fact that the day after we arrive the workmen will start to install new double glazed doors and windows, or pondering on the rolls of wallpaper we have bought on the assumption that two bedrooms will be redecorated. As for the wood burning stove that is being delivered direct to the house, Mr FF assures me that taking out the existing fireplace, putting in a new marble hearth and connecting the stove will be simple, I can't even imagine how we are going to lift the thing. As I said I'll soon forget about my garden.